It’s the season where some are running around trying to find last minute gifts. With all the pressure to get appropriate gifts in a short time line may result in overspending just for the sheer convenience. 1. Use LED Lights – For those of you decorating with Christmas lights this year, use the LED Christmas lights instead of the incandescent ones. Not only are LED solutions more environmentally friendly, they will help reduce that dreaded winter power bill. 2. Use the Secret Santa System – Instead of giving gifts to all of your siblings, or to every single one of your friends in your circle, how about using secret Santa system for each group instead? Implementing this system will help reduce the pressure and expense of purchasing so many gifts. 3. Re-Gifting – This seems to be a hot topic this holiday season as other bloggers have debated this issue. Personally, I have no problem with re-gifting. In fact, I think that it’s a great idea! If you receive a gift that’s not right for you, why not package it up and give it to someone who might enjoy it? 4. Give a Personal Gift – If you have the creative skills, how about baking a cake, making some cookies or creating a craft as a gift? Not only can this be economical, it’s a gift straight from the heart. 5. Donate to a Charity – Lets face it, a lot of people that you know do not need another gift this holiday season, however, charities are always in need of contributions. Try donating to a charity in someones behalf. The benefits? All parties involved will feel good about giving plus you’ll receive a donation tax credit to boot! 6. Have a Plan – Make a shopping plan and write it down, not only will it save time, it will save money by preventing the purchase of spontaneous gifts. Being Frugal lists 50 frugal christmas ideas. Money Ning explains 32 sensible tips for the holiday shopping season. Bible Money Matters also has 50 frugal gift ideas. Digerati Life gives us the best coupon sites for online shoppers. The Smarter Wallet lists some frugal gift ideas for the holiday season. Moolanomy gives us 9 smart holidays shopping tips. Cash Money Life shows us how to find holiday travel deals. Mr. Grinch, I mean Mike from Four Pillars suggests to not give any Christmas gifts at all! Lol – thanks for the link. I know the LED lights use less electricity and last longer, but I just can’t stand the look of them. The light they give off is far too ‘cold’ and ‘technical’, if that makes any sense. Another good way to save during xmas requires a bit of planning. Buy your decorations, wrapping paper, lights boxing day or afterwards for next year. They’re 50-80% off. thanks for the link! I didn’t realize that Lynnae had a 50 frugal Christmas ideas post as well! Thanks for the great links to read as well! We put LEDs on our Christmas tree this year and I really like the look, not to mention that I am less concerned about hot light bulbs adorning my tree too (LEDs burn quite cool). Our family no longer exchanges gifts between the adults, we just give to the kids and we have a cap of about $20 per kid (there are 3 children in this generation so far) though the grandparents typically shoot well over this number! Not trading gifts as adults saves a lot of money… not to mention it cuts down on the number of useless gifts that just sit unused in a closet for 10 years. Excellent tips, one tip that I posted on my site ( http://bullsbattlebears.com/?p=194 ) was about Christmas Trees. With the quality of “fake” trees out there getting better. Its much cheaper to get one these days. There are so many that look and feel like the real deal and you are able to re-use it over and over. This can save a bundle in time, energy (gas), money to purchase a real tree and you are helping the environment which is part of being frugal in it self. I’ve yet to see a conclusive report/study that proves that fake trees are better for the environment than real trees. They certainly save time, and probably money over a long enough time period. But not sure about gas or being better for the environment. In many municipalities, real trees are recycled and turned in to mulch/chips for the various parks and pathways. Re-gifting is a great idea but it only works if you have already received something. Otherwise the timing would be off and you would have to wait with it. Another tip may be to buy in bulk. If you get the same gift for a few people, you may be able to save some money if you buy it all together. Thanks Icowan. I’m like you, have done more shopping online and will continue to. Thanks for the link. Build baskets of chocolate and other goodies, they look nice, and you save a bunch of money. For the points you’ve added here, number 2 is definitely my favourite. It adds a little mystery to the now very-commercialised Christmas’ we have. Lol, I am thinking of sending cards to people saying something like: ” A donation from your name has been made to the New York Ballet Institute”.. Thanks for the mention! I personally love tip #4! It’s so much better to receive something personal, than some coffee gift box from Target. 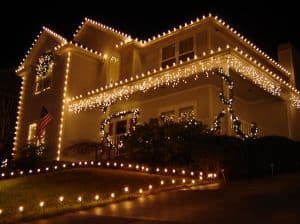 With regards to the tip about LED lights, I always wondered what the electrical bills of the people that setup beautiful lights like the one shown on the picture will be. I was so fed up paying the high electric bills, I decided to try out LED lights. I bought the LED lights to replace my old bulbs – CFL and incandescent – and guess what – my electric bills did drop a lot! Great tips for the holiday season. People can also benefit from shopping online. It helps the unnecessary pile up of gifts you don’t really need but do end up buying because they are right in front of you. Having a set list of gifts to buy is a must during the holiday season. Thanks for sharing the additional links as well.